A Quick Overview: A new overview provides all of the information that you care about quickly, while also enabling you to easily access more detailed information. More Detailed Reports: Analytics now includes more detailed statistics so that you can have a more precise understanding of your content and audiences. Audience Builders: Discover which videos are driving the most views and subscriptions. Audience Retention: See how far viewers are watching through your video in the new audience retention report. I tried it and found there are many useful features to help you understand more about audience, engagement. For example, Traffic source data, it allows you to understand how effective of Video embed on other channels beside YouTube itself. 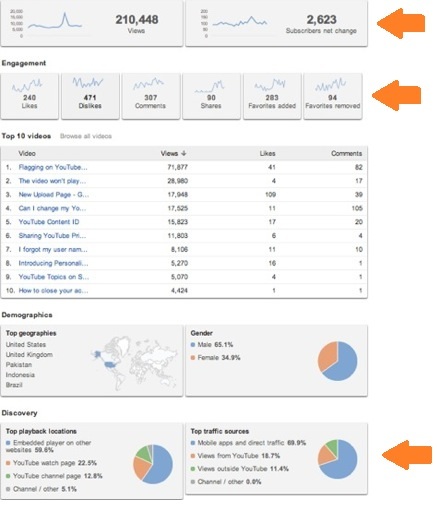 You can also take a look on infographic here that show you how to use your new Analytics to build and engage with bigger audiences, earn more money, and make better videos.